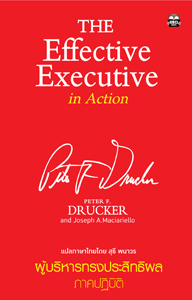 The Effective Executive in Action is a journal based on Peter F. Drucker’s classic and preeminent work on management and effectiveness – The Effective Executive. Here Drucker and Maciariello provide executives, managers, and knowledge workers with a guide to effective action — the central theme of Drucker’s work. The authors take more than one hundred readings from Drucker’s classic work, update them, and provide provocative questions to ponder and actions to take in order to improve your own work. Also included in this journal is a space for you to record your thoughts for later review and reflection. The Effective Executive in Action will teach you how to be a better leader and how to lead according to the five main pillars of Drucker’s leadership philosophy.